Left: The orbits (in red) of the two new exoplanets around XO-2S (black cross) compared with the inner planets’ orbits in our Solar System: Mercury (in black), Venus (in blue) and Earth (in green). 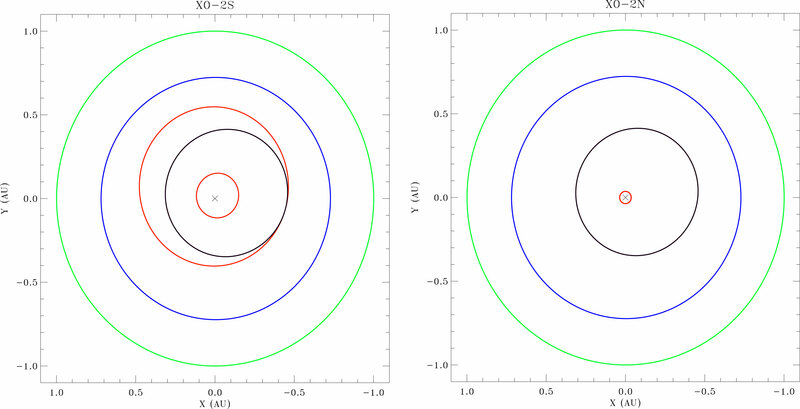 Right: The orbit of the Jupiter mass exoplanet around XO-2N compared with the orbits of Mercury, Venus and Earth. Credit: Silvano Desidera/INAF. Based on high-precision HARPS-N Doppler measurements at the Telescopio Nazionale Galileo (TNG) as part of the programme Global Architecture of Planetary Systems (GAPS), a group of astronomers led by Silvano Desidera of the INAF-Observatory of Padua, have discovered a planetary system composed of a planet slightly more massive than Jupiter at 0.48 AU and a Saturn-mass planet at 0.13 AU around XO-2S, the wide companion of XO-2N (30 arcsec, about 4000 AU projected separation). Also the companion XO-2N hosts a planets, revealed in 2007 with the transit method. The transiting planet has a mass of 0.5 MJupiter. The orbital period is about 2.5 days. There are also indications of a long-term trend in the radial velocities. This implies the presence of an additional orbiting object around XO-2S with an orbital period longer than 400 days, the duration time of our observations” says Silvano Desidera at INAF-Padua Observatory. “It should be a third planet or a brown dwarf or a low mass star. New observations will be done in the near future to determine the nature of this object”. The system XO-2S was observed with HARPS-N at 63 individual epochs between April 2013 and May 2014. The two stellar components are very similar and both are super-metal-rich in composition. While the two stars are almost twins, their planetary systems around them are not. This is the first confirmed case of a wide binary whose components both host planets, one of which is transiting. This fact makes this system a special laboratory for our understanding of planet formation processes and the influence of specific classes of planets on their parent stars, for example in terms of alteration of the chemical composition and angular momentum.